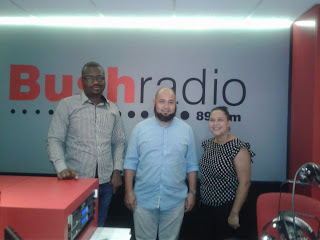 In studio, we were joined by Kim Webster who is the Sunflower Fund's Head of Communication and Nizaar Gamieldien, a 45-year-old man diagnosed with leukemia to talk on the importance of becoming a stem cell donor. The Sunflower Fund, hope begins with you is a non- profit organization. They are dedicated to create awareness through education and raising funds to cover tissue-type testing for the recruitment of blood stem cell donors. Many people such as Nizaar could be saved by a stem cell transplant. Basically, Nizaar would need someone to donate his/her blood for him to stay alive. The issue is that 25% of the patients will find a matched donor within the family but 75% of them will depend on YOU. Nizaar Gamieldien was diagnosed December 2015, "we were getting ready for the festive season, my wife and my child. I started to feel some discomfort in my body: tiredness, swelling in my left inside, night sweats, but I brushed everything off. Finally, I went to see my Doctor, the result came back, I had Leukemia." Nizaar continues: "It was such a shock and I decided to keep it secret. Meanwhile my sickness was already advanced in a stage called medically "accelerate" because I chose to ignore its symptoms. I have learnt that Leukemia doesn't discriminate at all. Regardless of your age, race, religion, gender, background you can suffer from it. I was depressed and then I met Sunflower Fund, a glimmer of hope came. I wasn't alone in my journey now and I decided to speak up, to help others with the same issue. I started to see my disease not as a curse but as a blessing: positive mindset brings positive result." The Sunflower Fund want us to become donors for such a noble cause. Money or any donations are welcomed, but especially stem cell to save lives.